Landscape photographers can take a stroll outside and have all the available light they crave. Portrait photographers, however, aren’t as lucky. Portrait photographers, particularly those that work out of a studio, have to manufacture their light – unless of course they are using light pouring in from a window. But for the most part, studio portrait photography involves setting up elaborate lighting, stands, and modifiers. 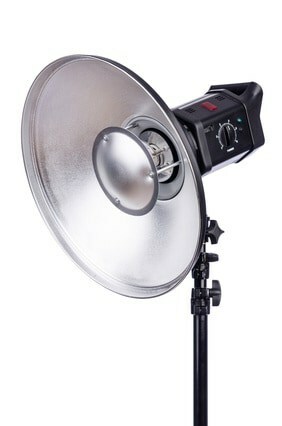 Light modifiers range from softboxes to strobes to umbrellas and reflectors to beauty dishes. Probably the least understood is the beauty dish, though it is a favorite among portrait and fashion photographers. And it’s become a trend to use it in sports photography as well. But what is a beauty dish? A beauty dish is simply a shallow parabolic disk that attaches to a light source. There is a plate covering the flash head – this causes the light to reflect back into and out to the sides of the main dish. Most of the light is aimed forward at the model because of the size and curvature of the dish. Beauty dishes come in a variety of sizes ranging from 16 to 30 inch diameters. The interior of the beauty dish comes in two coatings: the more popular white coating, or the silver color (which creates more contrast and brings out more detail than its white counterpart). Most light modifiers diffuse the light. A beauty dish reflects light, illuminating the subject from all angles because of its unique shape. Because the light wraps around the subject, it creates good contrast and highlights angles. A drawback, however, is that it is not very forgiving and can also draw unwanted attention to skin flaws. Photographers usually set up the beauty dish high and pointing downwards, accentuating a model’s high cheekbones. The somewhat harsh light creates shadows which bring out and sculpt the model’s bone structure as well as the eyes, lips, nose and chin. (This type of light is known as “butterfly lighting” because of the shape of the shadow cast under the nose and lips.) One way to create additional softness is to cover the beauty dish with a diffuser called a sock or honeycomb grid. This provides the photographer a variety of different moods and results with just a solitary light source. The value of the beauty dish is that it sculpts facial features and creates beautiful shadows and catch lights. (A catch light is the glint or spark in a model’s eye. If you examine a photo closely and see that the catch light in the model’s eyes is round with a small darker dot in the center, that’s a tip-off that a beauty dish was used. Softboxes, on the other hand, create larger rectangular catch lights.) This sculpting and defining that a beauty dish does so well is why their use has become so popular in sports portrait photography: the beauty dish accentuates muscles and textures and gives a dramatic and dimensional look to the photograph. Experimentation will be the route to bring out your model’s best features with a beauty dish. Information on Beauty Dishes was added to Photography Equipment. 2014/01/23 - Photos of RaeesaH was added to Fashion. 2013/10/01 - Photos of MelissaS was added to Swimwear. 2013/10/01 - Photos of PetruS was added to Fashion. 2013/09/02 - Photos of RaeesaH was added to Fashion. 2013/08/17 - Photos of MelissaJ was moved to Archive.